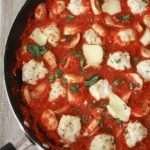 Basil Chicken Meatballs with Mushrooms and Roasted Tomato Sauce – Savory, tender meatballs in a gorgeous roasted tomato sauce. Guys, I have a new blog crush. Have you visited Ambitious Kitchen? 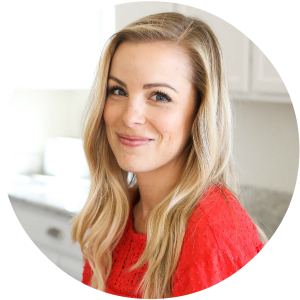 I’ve been smitten with so many of the beautiful recipes I’ve seen! Her rainbow-colored breakfast tacos, her browned butter nutella-stuffed chocolate chip cookies topped with sea salt (seriously, did you catch all that goodness? 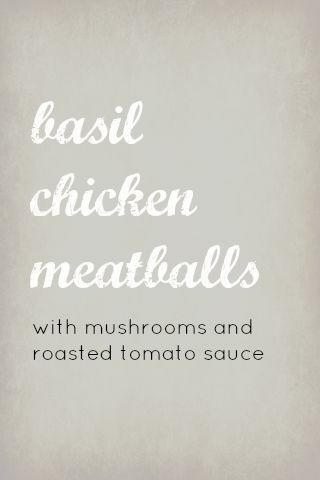 ), and these meatballs have had my eye lately. I plan on tackling both the breakfast tacos (sans smoked salmon for my pregnant self) and the nutella-stuffed cookies REALLY soon, but for now, I’ve got to just gush over these meatballs. These were SO delicious! Sophie, who really has issues with meat, adored them. They were so good, I caught myself popping one into my mouth whenever the leftovers container was open. I made a few changes to the recipe, swapping ground chicken breast for the ground turkey and changing up the spices just a bit (since pregnancy and spicy things aren’t agreeing lately). For the sauce, I used some of my beloved oven-roasted tomatoes and the flavors were divine! You can certainly serve these with pasta, which we did for Sophie, in buns for sandwiches, or over polenta or another favorite side. They were divine, and work beautifully for a freezer meal as well. If you have mushroom-haters at your house, feel free to leave them out. You could also add some sun-dried tomatoes or roasted red peppers, or saute some fresh bell peppers to add in. Make it your own! * For freezing, you can 1) make the meatballs alone and cook them, cool them, and freeze them then make the sauce later or serve with your favorite jarred sauce or 2) make the entire dish and freeze it. If you freeze the entire dish, I recommend storing it in a zip-top freezer bag for quicker thawing. Lay it flat on a cookie sheet in your freezer until solid, then feel free to stand it up or layer it in the freezer as you wish. In a medium bowl, combine chicken, egg, breadcrumbs, basil, mustard, oregano, salt, pepper, and garlic powder with a fork and toss until just combined. Using your hands or a small scoop to form 1″meatballs. You’ll end up with around 20-25 meatballs, depending on how large or small you made them. 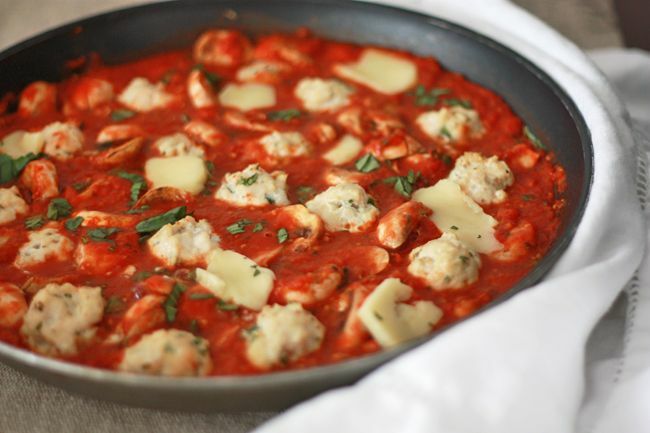 Place meatballs on a baking sheet lined with parchment or foil, careful not to have any of the meatballs touching. Bake at 400 degrees 15-20 minutes, or until just browning and fully cooked through. 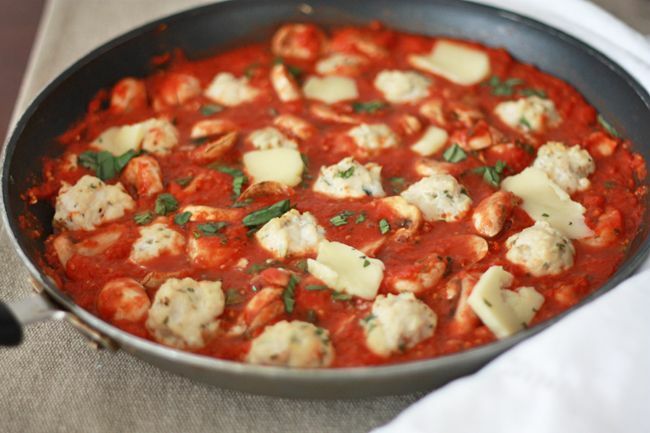 While meatballs are cooking, make sauce by pulsing oven-roasted tomatoes and tomato sauce in a blender or food processor until you’ve reached your desired consistency. I prefer mine to have a bit of texture, but you can certainly pulse till very smooth. Pour tomato mixture into your largest saute pan or a large pot and bring to a simmer over medium-low heat. Add mushrooms and cook until tender, about 5-8 minutes. Stir in basil. Taste sauce and add additional basil, salt, or pepper, as desired. If the sauce seems a bit thick, you can thin it with a little water, adding about 1/2c at a time. When meatballs have finished cooking, transfer them into the sauce and toss to coat. Serve with pasta, over polenta, or in buns for sandwiches, with additional basil and some fresh mozzarella (skip the mozzarella for dairy-free). *For a gluten free version: use gluten free breadcrumbs or make your own by pulsing a slice of gluten free bread in a food processor and using what you need. « 5 things to tell my birthday self. Wow, these look great! I’m a sucker for any meatball in homemade red sauce. Oooo! This looks like comfort food. Only it’s not the fatty greasy kind, it’s the kind that can comfort your stomach as well as your heart. Yum! 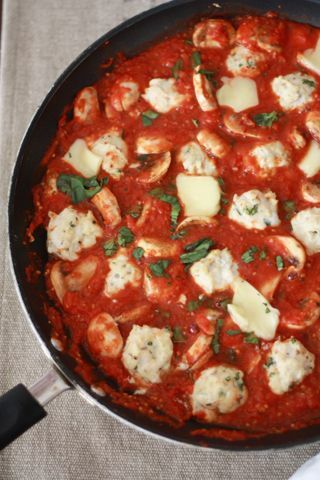 i love that these meatballs bathe in that red sauce! !